I’m proud to present my latest myofunctional therapy interview to the readers of my blog. 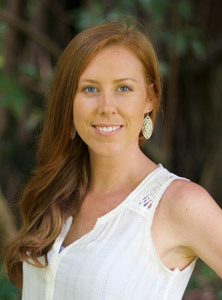 I was recently interviewed by Dr. Justin Trosclair, D.C. for his A Doctor’s Perspective Podcast. Over the years, I’ve been on a number of podcasts, spoken for professional groups, and been interviewed a fair amount, but I have to say that this podcast was definitely one of my favorite conversations about myofunctional therapy ever. From the earliest days of my myofunctional therapy career, I’ve tried to make more people aware of the benefits of the field. Reaching people with oral myofunctional disorders and related conditions has been a priority of mine, which is why I created this website and why I write articles like this for the blog section. I also know that getting the message in front of health professionals is vitally important as well. A decade ago, reaching doctors, dentists, surgeons, hygienists, and other health care practitioners was a challenge because the field of myofunctional therapy just wasn’t all that well-known. But in the last couple of years, that’s changed a lot. Myofunctional therapy is right in the middle of a paradigm shift! The field is benefiting from a surge in awareness and interest. This is happening because an increasing number of health professionals and patients alike now understand just how effective this therapy is when it’s part of a holistic and multidisciplinary approach to preventing and treating a range of health conditions. We’re also seeing an enormous amount of research being done in airway health, sleep medicine, and other myofunctional therapy-related areas. How Did This Myofunctional Therapy Interview Happen? 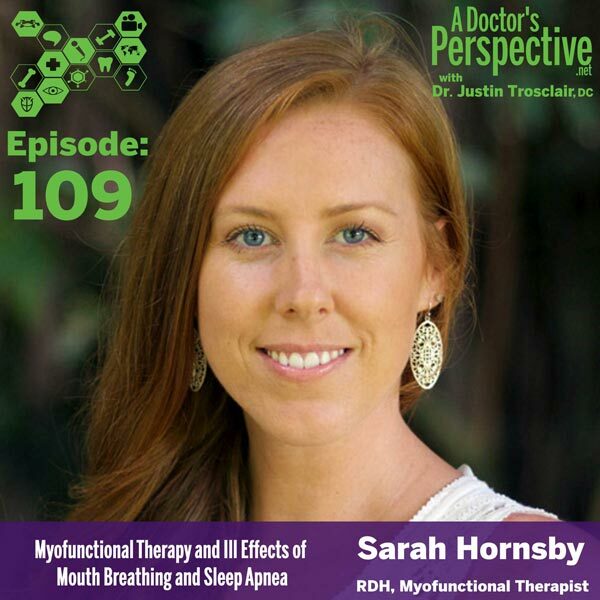 The circumstances behind this podcast with Dr. Trosclair are a great example of what’s happening in the wider world of airway and sleep medicine and myofunctional therapy. Dr. Trosclair is a chiropractor. His podcast is all about getting the perspective of medical professionals. He originally reached out to me after he first heard about myofunctional therapy from a doctor who appeared on the podcast. What was the connection between me and this doctor? I don’t know him at all but the doctor in question just happens to practice sleep medicine. Myofunctional therapy is a perfect fit with sleep medicine. It should be a core component of any multidisciplinary approach to preventing and treating sleep disordered breathing conditions including obstructive sleep apnea, UARS (Upper Airway Resistance Syndrome) and snoring. It didn’t take Dr. Trosclair long to start looking into myofunctional therapy. During his reading, he found my website and got in touch to see if I was interested in appearing on his podcast to do a myofunctional therapy interview. The answer was a definite yes! I’m seeing this type of connection on a daily basis in my practice as the word about myofunctional therapy spreads further and further. Myofunctional therapy is a critical part of addressing and treating sleep disordered breathing, tongue-ties, and TMD issues, along with other health conditions ranging from gastrointestinal disturbances to dental and gum issues. As the patients and professionals dealing with these conditions become more aware of the benefits of the therapy, the demand for myofunctional therapy services is growing. The best part of these ongoing developments is that more patients than ever are getting the care they need. What’s In This Myofunctional Therapy Interview? I think anyone with an interest in myofunctional therapy will take away something from this podcast. Whether you’re a patient with oral myofunctional issues, or the parent of a child who might have airway-related problems, or a healthcare professional, I think you’ll enjoy it. If humans evolved to breathe through the nose, why do start mouth breathing and why would we need myofunctional therapy in the first place? How is it possible that a mouth breathing habit can actually change the shape of a growing child’s jaw and face. What are the long-term consequences of this sub-optimal craniofacial development? What facial characteristics are most noticeable on people who have oral-myofunctional disorders and airway-related health conditions? Thumb and finger sucking, pacifier use, and breast-feeding. Are tongue ties a result of epigenetic changes? What are the differences between an anterior tongue-tie and a posterior tongue-tie? Can myofunctional therapy allow children to bypass the need for orthodontic intervention? Can orthodontic appliances help people with oral-myofunctional disorders? 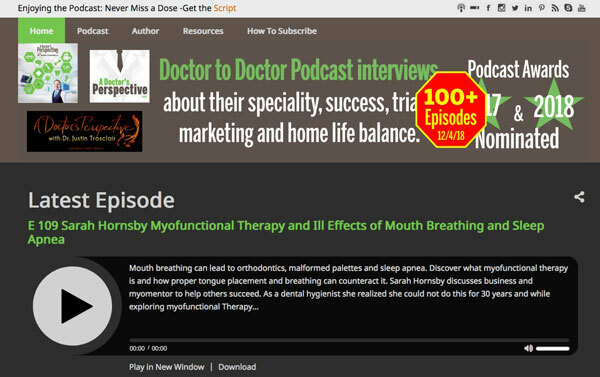 To listen to this podcast and what is my favorite myofunctional therapy interview, you can click the image or links above. Or you can click right here to access the page and show notes. The direct links to the episode on various platforms are listed below. I hope you enjoy it.